Limmud 2012 was in Berlin at the Jüdische Oberschule and that made it quite different from the previous Limmud festivals at Werbellinsee. The feeling was much less that of a closed community and more that of a regular conference. 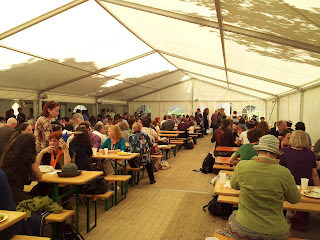 Luckily the next Limmud festival will (most likely) be back at Werbellinsee. The festival was well attended without feeling crowded. I talked a bit to the org team. They seemed as stressed as in previous years. Seeing how well the festival runs they really deserve a lot of respect and gratitude for doing this job. 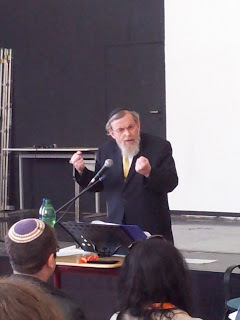 Highlights where the talks by Rabbi Cardozo which where approximately the same as the ones he gave at previous Limmud events (see the his YouTube playlists for a choice of videos), but still worthwhile to sit through. There were also lots of kids programs, like Ruth and Naomi, Ask the Rabi and of course lots of movies. The unusal venue in the middle of the city allowed for various tours which where also well frequented.